While the colder weather continues to come and go through this last stretch of winter, homeowners may be getting anxious to turn off the heat and open up the windows for spring. 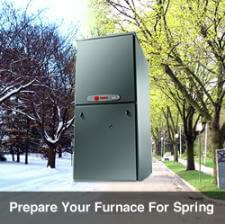 Before that happens, make sure you give your furnace and other system components the proper ‘shut down’. Just because we are using our HVAC system less on these mild days, doesn’t mean that our filter should be neglected. Continue to check your furnace filter monthly for a seamless transition into the cooling season. Do your part to ensure that air flow is not being blocked by dusty, debris-filled registers. Inspect the vents in all of your rooms to see if there is need for vacuuming. Take clean to a whole new level by scheduling a professional duct-cleaning with our friendly team of service technicians. Just because your furnace will be running less, doesn’t mean a carbon monoxide leak is impossible. Make sure that your CO Detectors are working properly by testing and changing the batteries if needed. Have you been using your whole-home humidifier all winter? Now might be the time to consider turning that humidifier down or off entirely. If the humidifier pad needs changed, get a head start by ordering a new one before next winter arrives. The stress of heating season can cause wear and tear on any furnace, no matter its age. If anything about your furnace seems off during the early days of spring, be sure to take care of it before it becomes a problem. For all of your heating and cooling needs, call Logan Services of Columbus, Dayton and Cincinnati, OH today at (800) 564-2611!